Only 35 Available at this price! 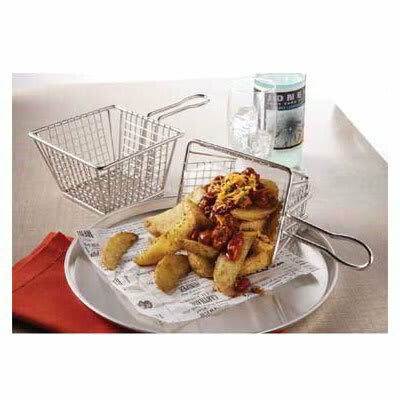 The American Metalcraft MSQBSKT square fry basket provides a unique look when serving fried foods. Since it is made of stainless steel, the dish is corrosion and minor damage resistant, making it ideal for commercial use. Measuring 5 inches long by 5 inches wide by 3 inches tall, the American Metalcraft MSQBSKT square fry basket is perfect for serving french fries, potato wedges, tater tots, and more. Basket Dimensions: 5 in. L x 5 in. W x 3 in.